The game of Bridge is a favorite with people all over the world. Young people, who grew up watching their parents and grandparents host Rubber Bridge parties, often play it at college. Ladies of leisure love to lunch out and play in Bridge-o-Ramas for a good cause. And seniors and retirees enjoy Duplicate Bridge, a great mind game that rewards your ability to focus, concentrate and reason rather than just your luck of the draw. Your performance is compared with that of others playing with the same good or bad hands. 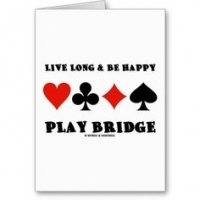 Playing Bridge will not only entertain you, but also move the gears in your head. Good at any age, your competitive instincts will be set in motion. Specialists in geriatrics find that patients who play bridge have more agile minds at higher ages than those who don't play. Playing Bridge is something that anyone can do on their own at local clubs, libraries, senior centers and on cruises also. Others are often looking for partners too. With advance notice, the people directing and running the games will find a partner for you! Just show up and have fun at cards! It's a great way to keep busy, get out, make new friends, and enjoy yourself - rain or shine, daytime or evening, all year round! If you don't know this great game, have never played, or need a refresher course, here is your chance. The American Contract Bridge League and the Cleveland Whist Club are underwriting an event, Learn to Play Bridge in a Day. The event will be held on Saturday, October 1 from 10:00 a.m. to 4:00 p.m. at the Cleveland Yachting Club in Rocky River. The seminar is open to the public and will include a booklet of the material presented, refreshments and a luncheon. Reservations paid in advance are $25 or paid at the door, $30. We guarantee you'll be playing bridge by the time you leave! Please join us! For more information, contact Edith Dus-Garden at 440-734-0296 or ediegarden@cox.net. Edith Dus-Garden is a Silver Life Master of Duplicate Bridge. She lives in Fairview Park.